Ground controllers turned Robonaut on Monday for the first time since it was delivered to the International Space Station in February. The test involved sending power to all of Robonaut's systems. The robot was not commanded to move; that will happen next week. 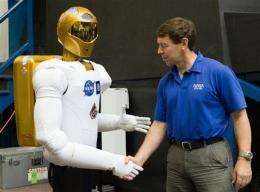 Robonaut - the first humanoid robot in space - is being tested as a possible astronaut's helper. The robot's handlers at Mission Control in Houston cheered as everything came alive. The main computers - buried inside Robonaut's stomach - kicked on, as did the more than 30 processors embedded in the arms for controlling the joints. "It's been asleep for about a year, so it kind of has to stretch out a little bit," Radford told The Associated Press. "Just like a crew member has to kind of acclimate themselves to zerogravity, our robot has to do a very similar thing, kind of wiggle itself and learn how it needs to move" in weightlessness. During Monday's two-hour test, U.S. astronaut Michael Fossum and Japanese spaceman Satoshi Furukawa took Robonaut from its sleeping bag, placed it on its fixed pedestal, then floated away as ground controllers took over. The robot went back into its bag following the test. "We want to be respectful," Radford said. "It's a very complicated piece of hardware." Another step in the road to the robotic revolution that makes just about all jobs irrelevant. I think the main purpose of the R2 is to be remote controlled from the ground. Operators will take turns to use R2 from the ground. What if R2 strangles an astronaut or miss-operates a vital human system? Who will be held responsible? Jesus, a robot power-on making breath-taking headline news. As if they never sure it would. That's says something about the nature of custom-make-every-thing-for-space-because-it-is-the-way-to-spend-tax-payer-funding! Do you know anything about that robot Skepticus? I happen to think it's a pretty neat piece of technology. Anything this cool will eventually be used as a means for destruction.. It will be said that "the androids walked alongside humans on their very first steps to the stars". YOu don't have to dig far for info on your neat piece of robotic prototype->wiki. It will tell you that the designed capabilities has not been fully tested in any depth before mission managers fanbois thought it's neat to sent it to space for publicity, because extensive mods, addon and programing will be needed for space environment. With per finger force of 5lbs, it will be hardpressed to use powertools except to do small nuts and screws, perhaps cleaning something with rags, and standing beside EVA astronauts as a glorified toolholder...after heaps more mods to make it external space capable! Then, the legs are an after thought after they rushed it to space...more mods and testing. And, by the way, do you see astronauts use their legs for space "walk"? But enough negativity. Enjoy your new fangled robot-in-progress.